Bubbly Bride Chloe love, love , loves spring flowers….. A small hitch , her wedding was late May…almost winter. 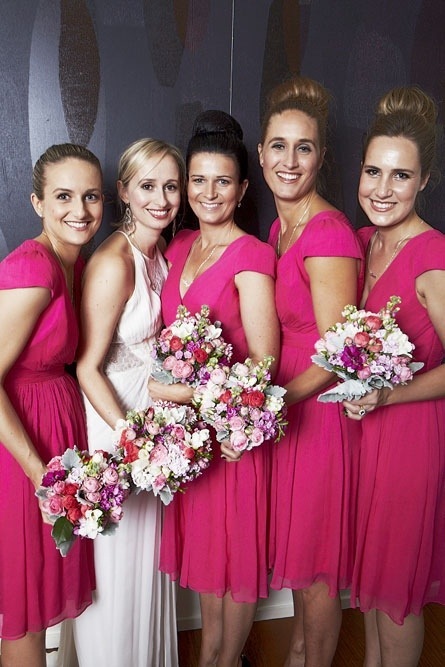 Luckily the very talented Helena was able to magic together a gorgeous array of springish blooms in all shades of pink which made these pretty dresses pop. The fabulous fragrance was a bonus. This entry was posted on Wednesday, June 26th, 2013 at 6:55 pm	and tagged with cottage roses, pink bouquet, Pretty posies, stocks, sweet pea and posted in Wedding Bouquets, winter flowers. You can follow any responses to this entry through the RSS 2.0 feed.